Alter Bridge’s first album, One Day Remains, was released in 2004. I bought that album on day one. I consider myself a “day one” Alter Bridge fan. I have since gone on to purchase every Alter Bridge album on the day it gets released as well as pre-order the digital copies. The band has been releasing music for 14 years. In those 14 years, the guys have broken out and released music with other artists, solo records, and been featured on other artists tracks. This Friday (September 7), Alter Bridge releases something that reinvents their music. Alter Bridge will be releasing an album and dvd from their performance from Royal Albert Hall, and it’s incredible. You don’t want to sleep on this release. 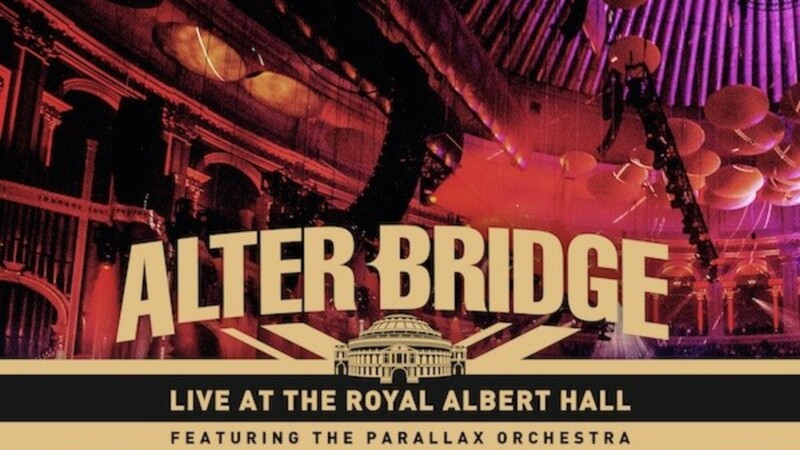 Alter Bridge partners up with Parallax Orchestra led by conductor Simon Dobson and they give the music a new life, not that any of these songs needed it. Some of these songs were written 15 years ago, released 14 years ago, and have been revived with a new take on these classics. I was lucky enough to get a press screening of the show, and my mind was blown. The show starts out with “Slip to the Void”, and you will be blown away with arrangement that the band and the orchestra came up with. While the song was true to the original arrangement, the orchestra added layers to it that you couldn’t imagine until you heard it. The added strings and music production to these songs is artistic. You can tell that the band was having an incredible time as well. When the band is having a good time, you know that the show is going to be better than if the band was having a crappy time. Myles and Mark were clearly having an incredible time on stage. A really fun feature on the video of the show is that they have done this in-depth documentary style overview of putting the show together. A crew went in and interviewed everyone involved in the making of the show. Not only was there an interview, but you also got to see footage from the rehearsals with the band and the orchestra. This was not only fun but very insightful to be able to see part of the creative process on putting the show together. This also humanized the guys a bit and showing them as people who still get nervous before big shows. The band takes a 25 minute break, which is one of the spots where they show us the documentary, but when they come back, they are even more on top of their music and performances. I wish I had the time to go song by song and tell you how great this show is, but I will tell you that one of my favorites is them playing “Ghosts of Days Gone By”. The orchestra really brings this song to new levels. This has always been a favorite of mine, but with the new arraignment, you can’t oflove this song even more. The strings help make this song so much more dramatic than it already is. The band debuted a song that has been on their discography for close to 10 years. “Words Darker Than Their Wings” is a song that the band never played live. It was one of the first times we heard mark sing the main melody on a track. Mark Tremonti said in the documentary that this song is one of his favorite song’s from Alter Bridge. He went on to say that this song they’ve wanted to play for a while and Myles has never really been open to it until this show. They played the song (you can watch below) and it was amazing. Mark’s vocals were on point like never before. The natural transition from “Words Darker Than Their Wings” is to go straight to “Water Rising”, which is the first song in which Mark sings the entire melody and Myles joins Mark on harmony. You are really going to enjoy this project. I think it’s a massive risk for the band to put together, but it paid off massively. If you love Alter Bridge, even a little, you will dig this project. Part of the proceeds for the show went to the Future Song Foundation, and group Myles Kennedy is involved of.